Professional landscaping solutions including driveways, patios, poolsides and more. To arrange a visit from a member of our helpful sales team. Tailored to suit any property, ReadyPave creates bespoke Decorative Concrete Paved Patio areas that excel in quality and beauty. 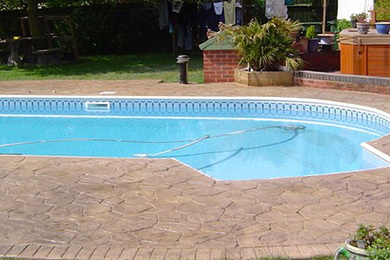 With an extensive palette of colours and textures to choose, ReadyPave can create distinctive and practical Imprinted Concrete pool surrounds to suit any property. Whether you prefer a stylish, contemporary look or a more traditional and rustic feel, ReadyPave can offer quality, durable and versatile solutions to suit any property. After ten years of working in the paving industry, Managing Director Andy Read formed Readypave Limited in 1998. During his training in horticultural landscaping and his experience in the construction industry, Andy learned invaluable knowledge regarding the importance of combining beautiful aesthetics with great structural design. Our team are knowledgeable, qualified and are dedicated to the company and its goals. By integrating the best materials available with quality workmanship, ReadyPave Ltd can create Decorative Concrete surfaces that will vastly enrich any property. ReadyPave can also include other aspects into our projects such as fencing and soft landscaping. This reduces the number of companies you will deal with, minimising disruption to your property. 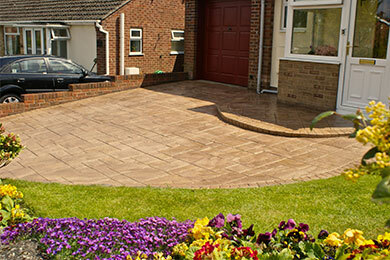 ReadyPave are an award winning practical landscaping solutions for homes and businesses. Winning awards such as the Golden Trowel Award (Best Domestic Project) in 2012 and the Highly Commended for Golden Trowel Award (Best Commercial Project) in 2010. Contact ReadyPave for a no obligation quotation and we’ll arrange a visit to you from a member of our helpful sales team to discuss your project. 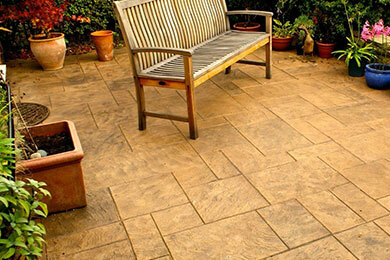 This service ensures that you get the very best advice from the very beginning of your paving project. ReadyPave are trusted throughout the local area, take a look at testimonials from our happy client base. "Many thanks for the quick and efficient way you and your team produced our replacement Pattern Imprinted Concrete Driveway. We are very pleased with the results. May we also say how helpful and courteous all members of your team were and how considerate they were to our neighbours as well." "I am very pleased with the result and look forward to additional work once the builders have finished. Many thanks for such a good job!" "Thank you for your service producing our new Pattern imprinted Concrete Driveway. It does give a satisfactory appearance and compliments our stonework. Your service has been excellent." "We are very pleased with the Driveway. Also I would like to thank all the men who worked on our Driveway, they are a credit to you." "May I take this opportunity to thank you for a first class job and wish your company all the success for the future." "Thank you for a good job!" "I would like to express our thanks to all your staff for doing such an excellent job. They have left the site very tidy after they have been and we are so impressed in how quickly the Imprinted Concrete Driveway has come to completion. If anyone I know ever wants their driveway resurfacing I will recommend Readypave every time. I am thoroughly pleased with every aspect of the the work and once again thank you for doing such an excellent job." "We would like to thank you and your team for our lovely Pattern Pressed Driveway and the speediness in which the work was completed, we are extremely pleased with the job and have already had many admirers of your work, we certainly would have no hesitation in recommending you to anyone. Thank you again for a lovely creation which has improved our home." "May I take this opportunity to thank you and your team for your prompt and excellent service." "Thank you for the free after service which was expertly executed. The Cobblestones are a good advert for your company." "I would like to thank you and your staff to the excellent work which has enhanced the appearance of our property." "I am writing to say how pleased I am with my drive. The teams that worked on it were very pleasant, helpful and very professional in what they do. I am very glad with the finished effect and would happily tell anyone." "Thank you for your efficient and high standard workmanship." "Both my wife and myself are very pleased with the final product and will now be spending many a sunny day sitting in the garden!" "Really tidy job - very pleased!" "My family and I would like to thank you and your men for making such a difference to our property. So many people have commented on the finished article, many of them not knowing that concrete can look like this and many who didn't see it being laid thinking it is cobbled. The whole procedure was so easy - stress and pressure free from the quotation been given right through to the sealant going on. your workmen are a credit to your company working in a polite, clean and professional manner. We were amazed on the first day when the digging out had been completed as on our return home there was no indication that any soil and debris had been carted away, everything was so clean and tidy. Our neighbours have said what a great team we had working here. Please pas on our thanks to all concerned. Your company came recommended to us and we will have no hesitation in doing the same." 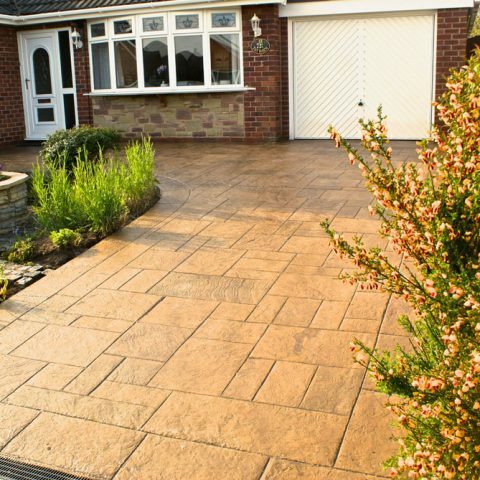 "Thought I would drop a line to say how pleased I am with the Drive and Patio. As time goes on I am more and more pleased I took the plunge. The front is now planted with jolly things for the time being. The camellia is restored to health and the plants I put in the drive are thriving and looking good. Everyone who comes to the house asks me who did the work and admires it. I have passed your details to a number of people; I think you may be doing some work for a colleague of mine in Kinnerton shortly. If you want to give my address to potential customers then go ahead. I found looking at your work, and chatting with a man at one of the addresses you gave me, very important in making my decision to choose you in the first place." "Just an e mail to let you know how pleased i am with the drive and pathway you did for us. The dark cobble affect looks perfect at our old cottage and is in keeping with our cottage garden. Being at work all day i did not see much of the lads working but was very pleased with how tidy the site was when i came home each night. My next door neighbour is a retired civil engineer and has spent most of his career supervising road works and is always very critical of any workmen if working for him or indeed me but said of you guys " The lads working on your drive are the best organised and hard working gang i have seen for a long time , everything they needed was delivered to site at exactly the right time and taken away when finished , the site was kept tidy at the end of each day and they worked hard all day i think think they are a credit to the the the company and what a professional company they are " that is very high praise indeed. Thank you again for a job well done!"